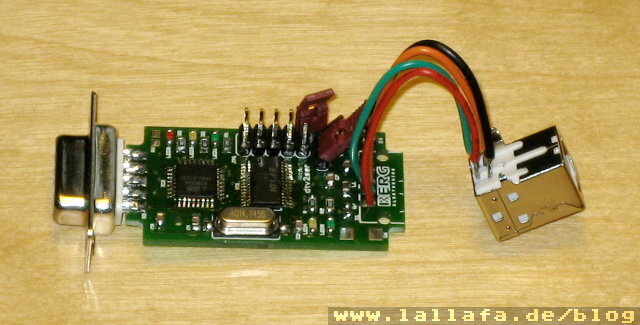 On the left of the board is the DB-9 joystick connector for the DTV connection and on the right is the USB connection. On the front right you can see two LEDs (green, yellow) that show the serial traffic running through USB. On the back left you can see the three dtv2ser LEDs (green, yellow, red) for Ready, Transmit and Error. The large pin header is for connecting the ISP to initially flash the ATmega8 and can be later on used to place the bootloader jumper and an optional reset button. 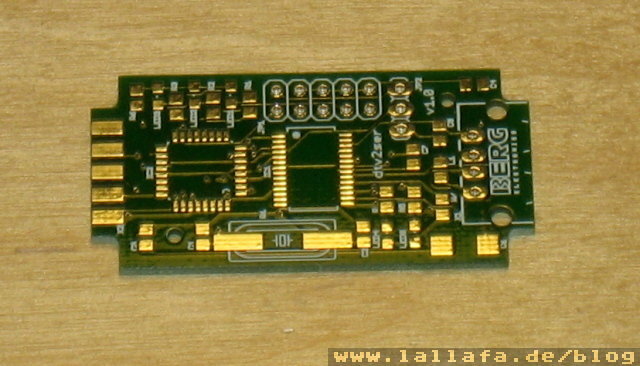 The other pin header is used to determine the power supply of the board: either from ISP (for flashing) or via USB (normal operation). I am currently waiting for my next part order from Reichelt. It contains the missing parts for this board and also five complete part sets for new boards.